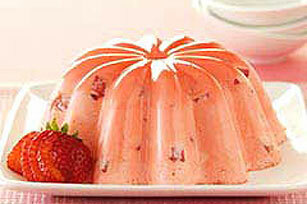 Customize this salad or dessert mold by combining your favorite gelatin flavor and chopped fruit. Whipped topping in the gelatin adds a creamy texture. Add boiling water to gelatin mix in medium bowl; stir 2 min. until completely dissolved. Stir in cold water. Refrigerate 1-1/4 hours or until slightly thickened. Add COOL WHIP; stir gently with whisk until blended. Refrigerate 15 min. or until thickened. Stir in fruit. Pour into 5-cup mold sprayed with cooking spray. Dip mold in warm water for about 15 sec. Gently pull gelatin from around edge with moistened fingers. Place moistened serving plate on top of mold. Invert mold and plate; holding mold and plate together, shake slightly to loosen. Gently remove mold and center gelatin on plate. Never use fresh pineapple in a gelatin recipe. Raw pineapple contains an enzyme that prevents the gelatin from setting. Garnish with additional fresh fruit and mint leaves just before serving.